FILE- In this March 22, 2017, photo, an Emirates plane taxis to a gate at Dubai International Airport at Dubai International Airport in Dubai, United Arab Emirates. The Middle East's biggest airline had reduced flights to the United States because of a drop in demand caused by tougher U.S. security measures. They include “heightened screening of personal electronic devices” and stricter security procedures around planes and in airport terminals, Farbstein said. She did not elaborate. Details of the new rules first became apparent in a statement by Dubai-based Emirates, which operates the world’s busiest airport for international travel. In the statement, Emirates said it would begin carrying out “pre-screening interviews” at its check-in counters for passengers flying out of Dubai and at boarding gates for transit and transfer fliers. It urged those flying through Dubai International Airport to allow extra time for flight check-in and boarding. 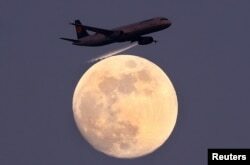 An airplane of German air carrier Lufthansa passes the moon over Frankfurt, Germany, April 9, 2017. A statement by Germany's Lufthansa Group said that “in addition to the controls of electronic devices already introduced, travelers to the U.S.A. might now also face short interviews at check-in, at document check or (at their) gate.” Lufthansa Group includes Germany’s largest carrier, Lufthansa, as well as Austrian Airlines, Swiss, Eurowings and several other airlines. The International Air Transport Association, which represents 275 airlines, did not immediately respond to a request for comment. However, Vaughn Jennings of the trade group Airlines for America said that while the new rules include “complex security measures,” U.S. officials have been flexible. “The safety and security of passengers and crew is the highest priority for U.S. airlines and we remain committed to ensuring the highest levels of security are in place throughout the industry,” Jennings said. However, not all were convinced of the new measures’ effectiveness. This is just the latest decision by President Donald Trump’s administration affecting global travel. The laptop ban as well as travel bans affecting predominantly Muslim countries have hurt Mideast airlines. Emirates, the region’s biggest, said it slashed 20 percent of its flights to the U.S. in the wake of the restrictions.